After three years together, Canadian (Toronto) based emo/hard rock act The Black Maria finally unveiled their Victory Records debut Lead Us To Reason in January 2005, which by all accounts was considered a surprising success with both critics and fans alike. The year that followed saw the band hit the road in support of their debut with acts such as Sum 41, Chevelle, Rise Against, Hawthorne Heights and Atreyu, but by the end of 2005, The Black Maria (Consisting of vocalist Chris Gray, guitarist Alan Nacinovic and bassist/keyboardist Mike De Eyre) had parted ways with founder/ex-Grade guitarist Kyle Bishop and drummer Derek Petrella, leading many to question as to whether the band would continue to be the same, or even exist beyond another year. Undeterred, the trio soon recruited ex-Far From Heroes members Scott Swain and Theo McKibbon (Guitar and drums respectively), wrote some new material and ventured into the studio for a second time with Mike Green (Who produced, engineered and mixed the album), which brings us to The Black Maria's sophomore effort A Shared History Of Tragedy. The Perilous Curse starts the album off in a rocking manner initially, but it isn't long before the band shows off the subtle changes of direction their second album has to offer with some slower passages and unobtrusive keyboard samples cleverly shuffled in amongst Gray's powerful vocals, the catchy riffs and the energy captured within the track overall. The current single/video Waking Up With Wolves (Which is lyrically based around the band's feelings of self doubt while on tour) takes the experimental approach of the opener one step further with its gentle verses continually building towards the choruses, while the pairing of Nothing Comes Easy But You and Living Expenses show the heavier side of the band's sound, without losing the essential rock aspect of their sound. The string enhanced heavy ballad Van Gogh, the slow burning Lucid and the predominantly piano based 11:11 gently eases the album down mid way through before A Call To Arms and Fool's Gold bring back the big rock sound, but it's the darker and far more adventurous duo of The Concubine and A Thief In The Ranks (Your Bike) that best combines the gentle and heavier sides of The Black Maria's new direction, which in turn makes them true stand outs. 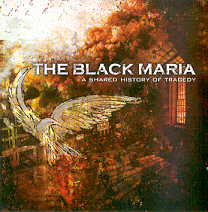 The Black Maria have not only survived, but also matured in the last year and a half, and it shows, because as good as The Black Maria proved themselves to be with their debut outing, I believe that the album doesn't come close to matching the dark beauty that lies within their latest effort A Shared History Of Tragedy.